I am looking for a product that would limit the amount of yellow staining we get on our hull each year. It’s a 2002 Cobalt (fiberglass hull), that is a slipped fresh water boat, with no bottom paint. We boat in a very clean lake, but still get a small amount of algae growth on the hull when it sits for a week or two, which easily washes off (in water). But after a month or two, the hull (all parts underwater) gets a slight yellow stain, that can not be removed unless the boat is removed from the water and acid washed. Any of your products that would help prevent the yellow staining? Our VS721 Bottom Coat will do the job for you, or at least it will help. Without knowing what the stain is caused by, it is impossible to give you a definitive answer. 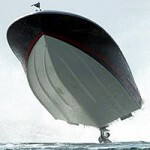 Our VS721 is used by many thousands of boat owners to reduce or eliminate growth and staining caused by marine growth. In most cases any slime or discoloration is simply wiped off with a sponge, while the boat is in the water, however, in some cases the material in the water will stain even the VS721 Bottom Coat. Gelcoat is porous and our VS721 Bottom Coat (actually a polymer coating) seals the pores and the VS721 polymer makes the surface more slippery than water, making growth attachment difficult or impossible. Some waterways contain dyes or pigments from natural or industrial sources that will stain everything and there is nothing that we know of that will prevent it. 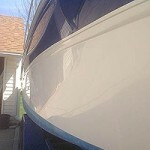 The benefit of the VS721 Bottom Coat is that the staining takes place on the polymer coating and not on your boat. Much like a sacrificial coating. My boat is in fresh water for 6 months at a time and I get about 1/16" of slime on the bottom at the end of the season. It washes off easily with Boat Clean Plus and a sponge. For best results, I recommend that you prep the bottom with Aurora Boat Scrub before applying 2 coats of VS721.